It’s the first day of college classes and you want to start things off on the right foot. You contemplate all the things that could go right – and wrong – throughout the term… Will you make a good grade? Will the professor be helpful? What if the material is boring and you can barely keep your eyes open? It’s normal to have these thoughts, especially if you aren’t familiar with the professor’s teaching style or if the subject is completely foreign to you. Have no fear! By the time you’re done reading through these five tips to follow on your first day of college classes, you’ll feel less stressed and more ready for the semester ahead! Depending on your school and the courses you’re enrolled in, you may be surrounded by 100 other students. These large classroom sizes can be rough, especially if you get distracted easily or want to have your voice heard. One of the best ways to become more than a number is to introduce yourself to your college professor! When I say introduce yourself, I’m talking about extending your hand to the professor that is standing just a few feet from you, not emailing them. Although computers and the online world have created a useful platform for communication purposes, it doesn’t necessarily make you stand out from the other students. If you take the few extra seconds before or after the class to simply shake the professor’s hand, say your name, and ask any questions you may have, then your face is more likely to stand out. Introducing yourself personally also shows the professor that you care and want to establish a working relationship. Trust me, you’ll want that relationship once the first assignment or test rolls around and you’re feeling a little overwhelmed by all of the material that needs to be covered. Pssstttt – I have an entire article on study tips for college students as well as a post that details all my secrets for getting A’s in college. Check them out! I know, I know… sitting in the front isn’t exactly everyone’s favorite spot. I’m not saying that this has to be your permanent location, but I highly recommend sitting there during the first day of college classes because it allows you to get a feel for what the professor’s teaching style is. Additionally, it puts you in a better position to pay attention to what the professor is saying. I absolutely cannot emphasize this one enough! Your course syllabus is practically your lifeline – it typically contains what material is going to be covered, the readings that are assigned each week, how you contact your professor during outside hours, required reading materials, and the school’s policies and procedures. It is your responsibility to read this thoroughly and follow it. If you have any questions make sure you ask your professor right away. This is why it’s so important to make this one of the first things you do on your first day of any college course. If you don’t read the course syllabus until later, then you may have missed valuable information that could have saved you a bad grade or two. 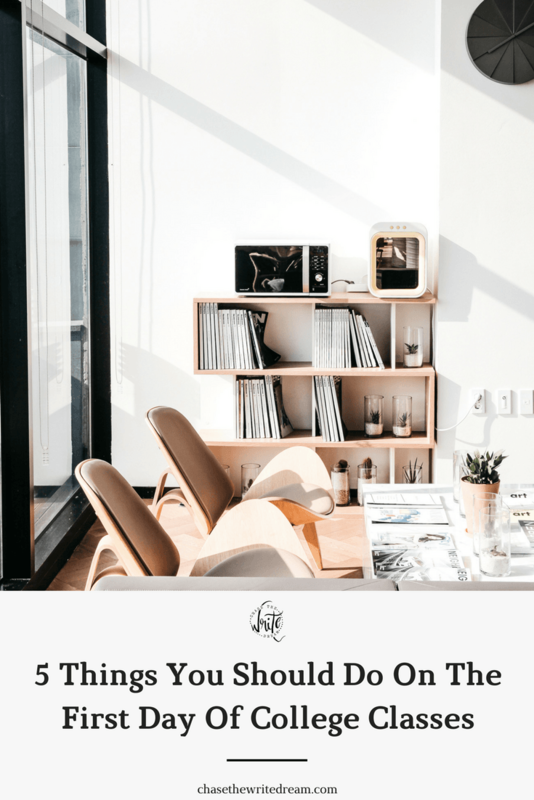 If you don’t have a planner already, I highly recommend that you invest in one (I have a great Resources page with some of my favorites, so be sure to head over there and check them out)! As you’re looking through your course syllabus and listening to your professors for the first time, jot down any important dates that you hear. Most of my professors had weekly assignments and readings, so I quickly made note of those in my planner. Additionally, your professor should provide you with any due dates for large exams or projects. You may want to highlight these, star them, or do something else to make them stand out from the rest of your assignments so that you don’t forget about them. I like to write mine at the very top of my schedule for that day so that I can easily see it when I’m skimming through my planner for upcoming due dates. Extra Tip: Another thing you will want to do during the first day of college classes is get started on your reading! It is very easy to get behind, especially if you are taking multiple classes, so make sure you jump right in and start getting comfortable with the material. Read Solutions for Every College Student’s Time Management Problems if this is something you really struggle with! This may not be high on your priority list on the first day of college classes, but trust me, you’ll wish it was when you come down with a cold and miss class or you can’t seem to understand all the material you’ve covered before a big exam. As you progress through the term, make sure you maintain at least some contact with this person. Who knows, you may even end up making a new friend out of it! It may be weird to ask for their phone number right away (though I’ve known some students who have), so start by exchanging emails. At least if you have this form of contact, you can scan notes to each other if one of you had to miss class, and you can begin scheduling any study sessions you would like to have. You should be able to get a good feel for which courses are going to be the most demanding, so make it a point to prioritize your assignments from the very first day you start a college class. Everyone prioritizes differently, so do what works best for you. Ultimately, your goal is to make sure that all your assignments are completed on time (zeros will come back to haunt you). 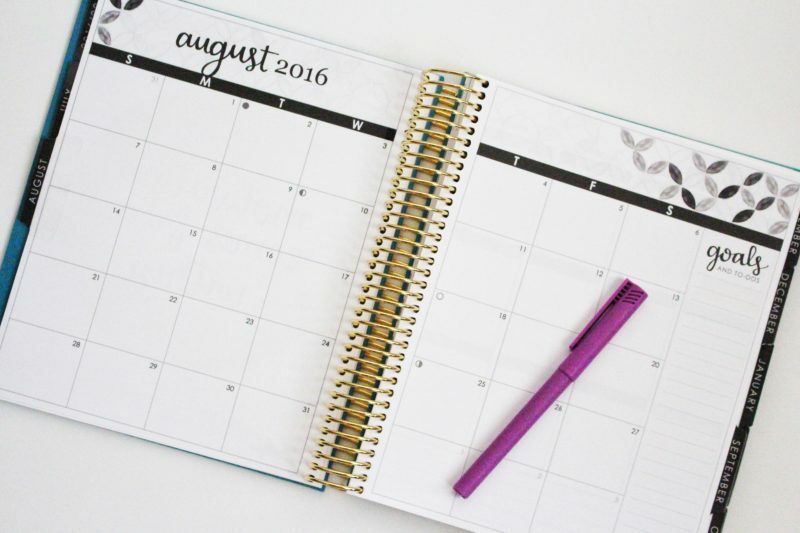 If you aren’t sure of how to manage your time wisely, then Stress-Free Scheduling is for you! If you have any tips to share about what to do on the first day of a college class, I would love to hear them! Please feel free to sound off in the comments below! Read Must-Have Items for Your College Backpack to make sure you bring all the essentials you’ll need for class! Also, check out the Free Degree Planning Guide I made for college students. Thanks for posting this. I’m currently a junior and I still haven’t mastered prioritizing my classes or forming relationships with my professors. Those are always good reminders. I was also commenting to show you the new blog I just started. It’s for girls with depression and anxiety. Have a blessed day! Thanks for stopping by 🙂 I think that there’s always improvements that can be made – It’s always good to have those reminders to help us get our minds in gear and ready to take on the new challenges that we’ll face. Congrats on starting your blog! Always an important topic to discuss. All the best! I found this VERY helpful! Thank you Tori! Also, I do agree whole-heartedly on the Syllabus Tip. It is the first thing I start to read on the first day of school! I never ever skip reading it! I’m so glad you found it helpful, Eva! The syllabus is seriously a college student’s best friend. I would have been lost without mine! Put a post it note in the front cover of all your textbooks with your email address on it. If you forget your book the finder can get it back to you. Great post! I just finished my first year of college and I’ve tried most of these things. Good way to start a successful semester! Thanks for sharing! It is so important to put yourself in a spot where you are alert. This was a good read! Reading the whole syllabus is important! You don’t want any big surprises, but a firm handle on what needs to get done!